Story time is the most favorite time of the day for both of my boys. It’s something they always look forward to. Whether it’s a story before bed, a chapter before dinner, or a quick read during a break, they never tire of the adventures and characters from their favorite books. There is no such thing as too young for a book and these 10 New Baby and Toddler Books are a great way to start them out. We are always on the lookout for a new and exciting read. 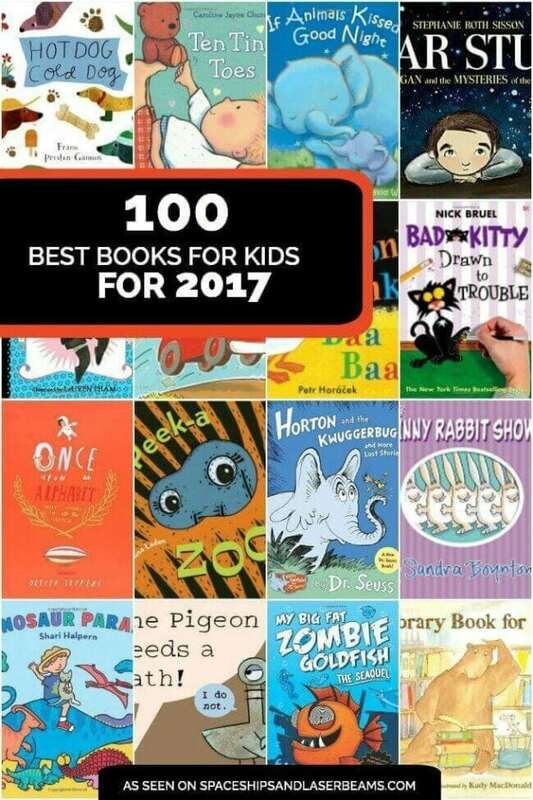 With this list of 100 of the Best Books for Kids, we can find our next favorite to match their reading skills. Books like The Pigeon Needs a Bath, Blizzard, This is a Moose, and Blue on Blue are perfect for my beginning reader. 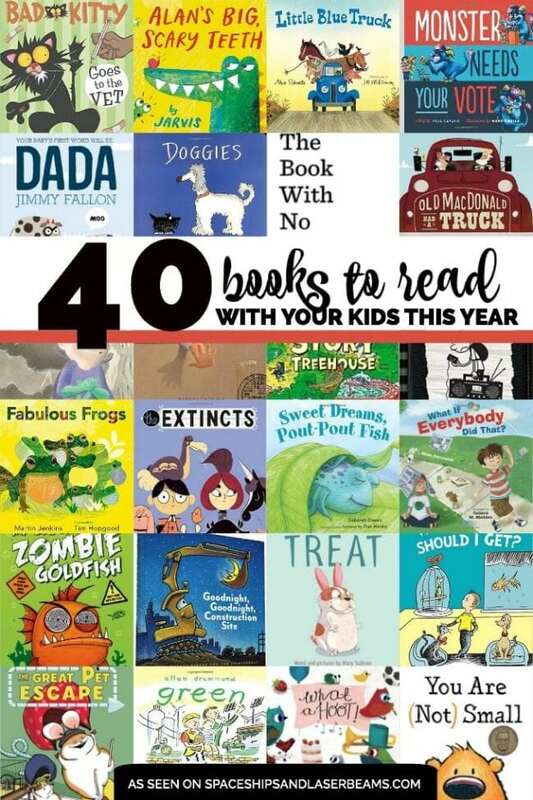 More advanced books such as The Book with No Pictures, Firebird, Like Carrot Juice on a Cupcake, and My Big Fat Zombie Goldfish top the list for my older boy. This list is full of great books for all ages! Caroline Jayne Church brings her adorable toddler art and lovely rhymes to this joyful twist on the tried-and-true classic, HEAD, SHOULDERS, KNEES, AND TOES. Everybody does it: Kitty, Doggie, Daddy — even Mommy! And when Leslie Patricelli’s beloved bald baby does it while running, it sounds like a train. When Cow gets her hooves on the farmer’s car, she takes it for a wild ride through the country. Moooo! But a bump in the road brings this joy ride to a troublesome end. Moo-moo. . . Perfect for the holidays, baby showers, and happy occasions of all kinds, this is a literacy-nurturing gift that babies can literally sink their teeth into! A subject dear to children’s hearts is in the spotlight as Leslie Patricelli’s beloved baby character returns. From award-winning author/illustrator Frann Preston Gannon comes this celebration of wiener dogs (dachshunds) in all their variety–perfect for dog-lovers of every age! Read the clue . . . guess the animal . . . giggle wildly . . . and repeat! At long last, board book virtuoso Nina Laden has created a companion to her beloved classic Peek-a Who? (one of Scholastic magazine’s 100 Greatest Books for Kids with more than 800,000 copies sold). repare for liftoff with 8 exciting aircraft and the noises they make in this irresistible board book!The long, oversized format lends itself to the shape of the vehicles and stands out on the shelf, and the boisterous text begs to be read aloud. The latest addition to Sandra Boynton’s phenomenal bestselling Boynton on Board series, this book stars a cast of high-kicking bunnies performing in perfect unison to a lively song all about . . . them. What do the animals say? Celebrated author-illustrator Petr Horácek explores the question in a colorful novelty board book for babies. Parents can begin to develop literacy in even very young children by exposing them to the letters of the alphabet, making U is for Underwear a fun and easy tool for imprinting little brains. From New York Times best-selling illustrator Sue Heap comes the perfect antidote for reluctant sharers everywhere. The Pocket Piggies board books marry the inherent appeal of Teacup Pigs to the sweetness of the board book format. The photographs are full-color, full-page, and up-close. This colorful parade of dinosaurs is a visual feast for very young fans of prehistorical creatures. The simple text and bold illustrations are ideal for preschoolers who are fascinated with these magnificent animals. This joy of discovery is evident on the faces of these little kids as they open up a book and find a favorite story. Read this board book alongside William Wegman’s 3…2…1…Circus! for an entertaining and educational puppy pairing. Accept Hervé Tullet’s irresistible invitation to mix it up in a dazzling adventure of whimsy and wonder. This book about the wonder of a winter storm is as delicious as a mug of hot cocoa by the fire on a snowy day. Inside a tent it’s cozy. But what is going on outside? Is it dark? Is it scary? Not if you have your trusty flashlight! Told solely through images and using a spare yet dramatic palette, artist Lizi Boyd has crafted a masterful exploration of night, nature, and art. This is the story of four puppies: Fi-Fi, Foo-Foo, Ooh-La-La, and Gaston. Can these puppies follow their noses—and their hearts—to find where they belong? MOOSE? Yes, Moose! When a movie director tries to capture the life of a moose on film, he’s in for a big surprise. In the grand tradition of “Raindrops on roses and whiskers on kittens” comes an uplifting tribute to 100 everyday things worth celebrating. Rupert has a big secret. When his owner, Mandy, is fast asleep, he likes to slip on her dancing shoes and dance the night away. Then one night Mandy catches Rupert in the act. Curmudgeonly Bear succumbs to Mouse’s entreaties and discovers the joy of books in a hilarious story that fans will covet for their own library. Antoine de Saint-Exupéry was born in France in 1900, when airplanes were just being invented. Antoine dreamed of flying and grew up to be a pilot―and that was when his adventures began. From two-time Caldecott winner Chris Van Allsburg, creator of Jumanji and The Polar Express, comes a poignant story of one hamster’s struggle with destiny. Being a pet store hamster isn’t much fun for Sweetie Pie, but life in human homes proves downright perilous. Tom is looking forward to their annual family trip to the seaside, right up until he hears about the Evil Eel of Eel Bay–a monster that Mark is entirely too interested in. After all, even a BIG FAT ZOMBIE GOLDFISH might have a little trouble with a Super Electric Zombie Eel! This series is part of Scholastic’s early chapter book line called Branches, which is aimed at newly independent readers. In this seventh installment of the New York Times–bestselling series, Kitty encounters what may be her most formidable foe yet: her creator! Kitty soon learns that feline manipulation works both ways―especially when you’re at the wrong end of your author’s pencil. Fourth grade was supposed to be a fresh start, but Mike’s already back in the principal’s office. He’s not a bad kid. He just can’t sit still. A hilarious companion to the New York Times bestselling Miss Brooks Loves Books! (and I don’t) about the power of stories and storytelling. When Widow Tulip Jones of Bore, England, inherits a ranch in By-Golly Gully, Texas, and moves in with two trunks of tea, twelve pet tortoises, and three servants, hilarity ensues. The peaceful life suits the wealthy widow fine until word gets out and every unmarried man in Texas lines up to marry her. Grace has lots of new and exciting things to share in the latest addition to the Just Grace series! There’s a new crossing guard in town named Marie who needs a bit of help making friends, a fun substitute teacher for Miss Lois, and most exciting, Grace and Mimi are going to have their own table at the craft fair! Though the Greek and Roman crewmembers of the Argo II have made progress in their many quests, they still seem no closer to defeating the earth mother, Gaea. Her giants have risen-all of them-and they’re stronger than ever. It’s wintertime at Greenglass House. The creaky smuggler’s inn is always quiet during this season, and twelve-year-old Milo, the innkeepers’ adopted son, plans to spend his holidays relaxing. But on the first icy night of vacation, out of nowhere, the guest bell rings. Rose Howard is obsessed with homonyms. She’s thrilled that her own name is a homonym, and she purposely gave her dog Rain a name with two homonyms (Reign, Rein), which, according to Rose’s rules of homonyms, is very special. The final Origami Yoda case file from the kids at McQuarrie Middle School! After successfully fighting to save their field trip in Princess Labelmaker to the Rescue!, Tommy and the gang prepare for a well-earned day of fun and adventure in Washington, DC . . . but of course it won’t be that easy! “Magic is “messy and dangerous and filled with longing,” we learn in this brave tale of grief, villainy and redemption that borrows from the story of the Snow Queen. For fans of Frozen, The City of Ember, and The School of Good and Evil, the New York Times bestseller The Mark of the Dragonfly is a fast-paced adventure story about a mysterious girl and a fearless boy, set in a magical world that is both exciting and dangerous. As befits a future President of the United States of America, Maggie Mayfield has decided to write a memoir of the past year of her life. It’s 1964, and Sunny’s town is being invaded. Or at least that’s what the adults of Greenwood, Mississippi, are saying. All Sunny knows is that people from up north are coming to help people register to vote. Bestselling author Tony Abbott’s epic new middle grade series, the Copernicus Legacy, begins with The Forbidden Stone, a thrilling adventure packed with puzzles, intrigue, and action. ouching and powerful, each poem is both accessible and emotionally charged, each line a glimpse into a child’s soul as she searches for her place in the world. Captured as a baby, Ivan was brought to a Tacoma, Washington, mall to attract shoppers. Gradually, public pressure built until a better way of life for Ivan was found at Zoo Atlanta. As narrated by Tuesday, Tuesday Tucks Me In is a day in the life of this service dog extraordinaire and tail-wagging ambassador for all things positive and uplifting in the world. The gift was to commemorate the 100th birthday of the United States, and just packing it was no small feat–350 pieces in 214 crates shipped across the ocean. The story of how the 111-foot-tall lady took her place in the New York Harbor will fascinate young readers. on Scieszka’s Guys Read anthology series for tweens turns to nonfiction in its fifth volume, True Stories. The fifth installment in the Guys Read Library of Great Reading features ten stories that are 100% amazing, 100% adventurous, 100% unbelievable—and 100% true. This page-turner offers 125 heart-warming and hilarious anecdotes, illustrated with full-color photos of these intriguing animals. Celebrate the 50 years of Charlie and the Chocolate Factory with this scrumdiddlyumptious book about the iconic novel and author! Last summer, the Sibert Honor–winning duo Caitlin O’Connell and Timothy Rodwell witnessed the birth—and growth—of a baby elephant. A memoir in paintings and words by internationally acclaimed illustrator, author, and teacher James McMullan. Lillian Gilbreth was the subject of two movies (Cheaper by the Dozen and Belles on Their Toes), the first woman elected to the National Academy of Engineering, and the first female psychologist to have a U.S. postage stamp issued in her honor. Kids will enjoy reading these great book ideas.